The MK 15 Phalanx provides ships protection against incoming missiles and aircraft. [vi] It is composed of six 20mm gun barrels, and fires up to a rate of 4,500 rounds per minute. The Phalanx is also equipped with its own search radar and tracking radar, which allows for the system to work independently of other systems. [vii] The Phalanx is capable of detecting an incoming attack, track the missile or aircraft, and engage the threat automatically. This provides a faster reaction time to ensure safety of the vessel. The Phalanx has had several versions throughout its career. Block 1: Extended the range to high altitude missiles with an improved antenna, and improved ammunition capacity by 50%. 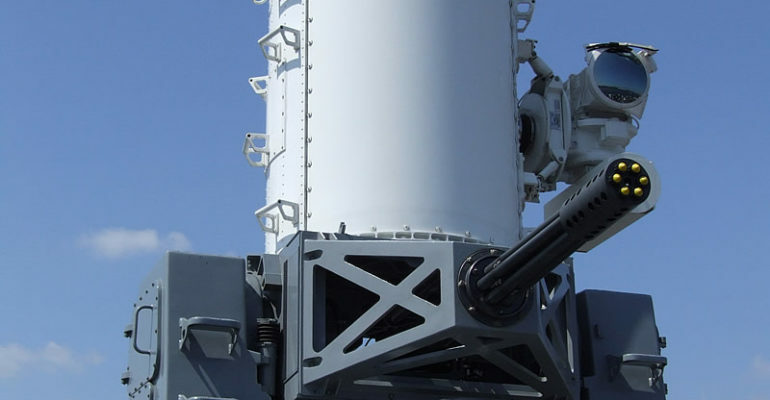 Block 1B Phalanx Surface Mode (PSUM): Added a Forward Looking Infrared Radar (FLIR), which allows the CIWS to engage hovering or slow-moving aircraft and surface craft. The Phalanx is a necessity for U.S. naval ships to enter disputed seas, or seas with a U.S. adversary conducting “Anti-access/area denial” (A2/AD) operations within the territory. A2/AD is an increasing issue in areas such as the South China Sea and the Baltic territories. Without systems such as the Phalanx, U.S. naval vessels would be vulnerable to cruise missile, ballistic missiles, or aerial attacks. Having the capability to shoot down incoming threats can give U.S. sailors confidence to maintain the balance of power on the sea. 1980: Block 0 was installed on the USS Coral Sea. 1988: The Block 1 configuration was installed on USS Wisconsin. 1999: The first Block 1B installation was aboard USS Underwood (FFG-36).